We are the nation's largest automotive retailer with over 320 locations from coast to coast. We sell new and pre-owned vehicles from 35 manufacturer brands and offer a broad range of finance, insurance and warranty products. 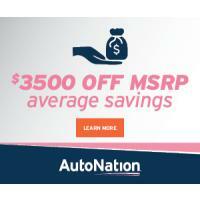 Shop over 100,000 vehicles at AutoNation.com and save an average $3500 OFF MSRP, get a $150 Gas Card and 15% OFF Parts & Service when you lease or buy a vehicle at AutoNation.